Explore two of the most beautiful chateaux in France on a unique day trip from Paris! 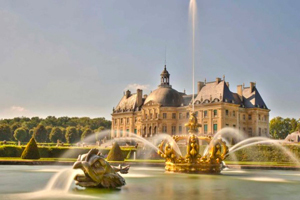 The tour of the chateaux is a day trip from Paris that has been designed for all those who love the romance of a castle, royal luxury and French elegance. You will be able to spend an entire day exploring the area surrounding the French capital, visiting the Chateau of Vaux le Vicomte which was the inspiration for the later construction of the Palace of Versailles and the Chateau of Fontainebleu which was nicknamed "The House of the Centuries" by Napoléon I as it was the source of so many historical changes. Explore the Chateau of Fontainebleu and its majestic forest. By booking a tour of the chateaux, you will be able to visit a couple of the most beautiful chateaux in France with just one booking and one trip. The first stage of the tour, which leaves from the centre of Paris, will be the Chateau of Vaux le Vicomte. This famous and majestic imperial chateau was designed by three of the most famous artists of the time, (the middle of the XVII century), and inspired King Louis XIV in the construction of the Palace of Versailles. The Audio-Guide with its wonderful commentary, will tell you all about the history of each room in the chateau, including the famous wineries. Join in with the discovery of the chateau and at the same time, the beauties of nature as you enjoy a stroll around the marvellous gardens in the formal French style. This is the perfect place to enjoy a picnic (not included) in the fresh air, beside the lake. The second part of the tour will take place about 45 minutes away at the Chateau of Fontainebleu. Here you will find a range of different styles ranging from the Medieval to the Renaissance and Classic as each of the French kings wanted to leave his own stamp on the building of the chateau. Of special interest is a visit to the throne of Napoléon I and the famous horseshoe staircase inside the chateau. Similarly here, after you have finished your visit inside the chateau, you can enjoy the relaxing atmosphere that pervades the picturesque gardens which surround this iconic building. The coach returns to Paris at 17:15 hours. The Tour is available on Mondays, Tuesdays, Fridays and Saturdays from 09:15 to 18:15 hours.